That's a decent cover on this issue of ACTION-PACKED WESTERN, and you know any story by Gordon D. Shirreffs is going to be worth reading. 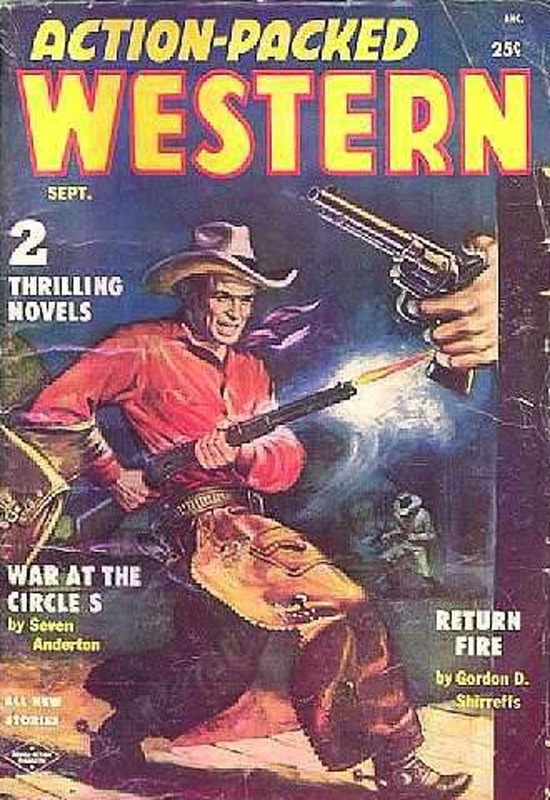 Seven Anderton is supposed to be pretty good, too (he's one of the authors I have to get around to reading), and there are short stories by veteran Western writer A.A. Baker and editor Robert A.W. Lowndes under his John Lackland pseudonym. I am adding Shireffs to my list of must-read newly discovered authors. Yes, I'm far behind in my reading, and so many names are new to me, but your excellent blog helps me make up for lost time. Bravo! After all these years I'm still finding authors who are new to me whose work I really like. I'm afraid it's a never-ending process! Yeah, James. But that's a good thing, eh? I walked into a library back when I was eleven years old and it suddenly hit me, "I'm never going to get to read all these books!" And yet, I'm still working on it. Fun!